Following the attacks in Paris in 2015, the new RER inter-urban train station Rosa Parks, in the north-east of Paris, couldn’t be opened as planned. Throughout 2016 portraits were created of the people living in the district surrounding the station, with the cooperation of local community groups (Espace 19, ALJT, Une Chorba pour Tous – A Soup for Everyone. 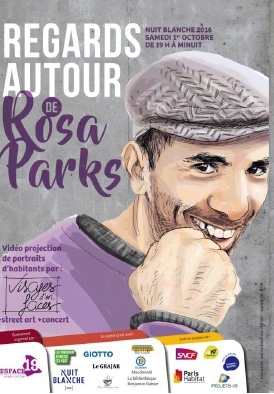 The portraits were projected in the hall of the Rosa Parks station during the “Nuit Blanche” 2016, the annual event when Paris stays open all night. The project was supported by train operator SNCF, Paris Habitat, the councils of Paris and the 19th district. This transitory space, for several hours, became a meeting place. Other artists also participated in the event including Jordane Saget, who drew a fresco in chalk, and numerous musicians (Rivkha and the Last Minute Choir, The Fantasy Orchestra…). Head of Mission, Nuit Blanche, The department of cultural affairs, Paris City Council.